These easy kabobs are a great appetizer for parties or holiday meals. Shrimp Dumplings with cilantro and garlic and paired with a hot sesame oil/sesame seed dressing. Food match made in heaven! In a wok, HEAT the oil in high heat. STIR FRY garlic and onion for 30 seconds. Add the brown sugar, roasted red chili paste and fish sauce; continue stir-frying for 2-3 minutes, until onion starts to wilt and soften. Add peppers and peas and cook for about 3 minutes. 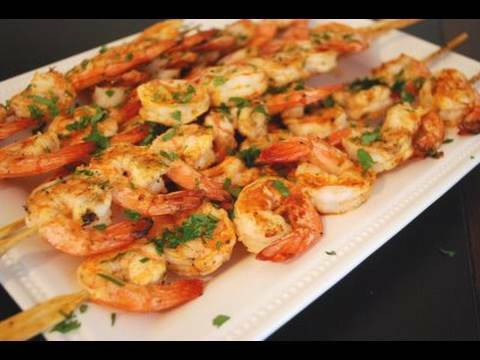 Add the shrimp and cook until they turn pink-orange in color, about 1-2 minutes. Serves 2-3.